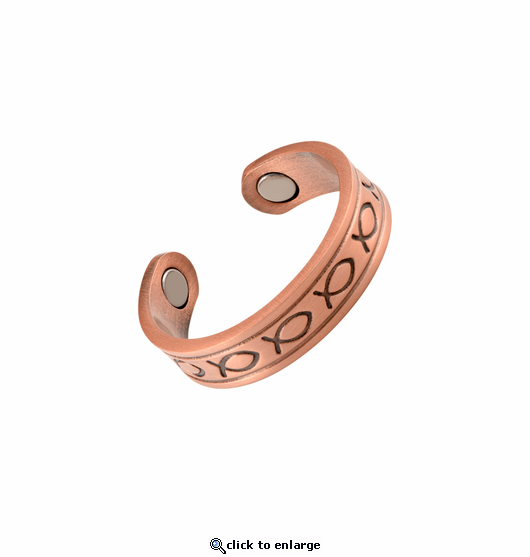 This is a nickel free copper magnetic adjustable ring is styled in burnished copper with the ancient Ixthus fish symbol. It has a 1500 gauss neodymium rare earth bio north facing magnet on each end. It will fit small to medium finger ring sizes about 6 - 9. I enjoy the looks of the ring and the positive comments by friends. I noticed an exceptional difference when wearing my copper/magnetic jewelry. Thank you so much. I would give your product the fish rings 5 stars +. Since they worked so good I keep wondering I if could make something up that might work on my dogs. They are Golden retrievers the in their golden years their back legs are getting a little stiff. I have terrible arthritic pain in both my thumb joints and have worn copper rings on each for several years with fairly good results. However, I have to admit having the addition of the magnets with the copper has made a big difference. Thumb joints very quiet since wearing them. highly recommend. love the fish design. A nice quality ring, that is adjustable. I can wear it on any finger. It also looks presentable as a wedding band, and the fish design makes it complete! I have noticed less stiffness in my fingers and wear it all the time. A very comfortable ring. I wear it all the time, except for bathing as it has helped with my stiffness.